Each instrument, bow and case is marked with a sticker or tag clearly stating the price for that item. Prices are not negotiable down, however, if you feel that an instrument or bow may be underpriced, we can discuss a higher price. 1. Name and reputation of the maker. Traditionally, this is the most important factor in determining the value. It takes many years to build a name and reputation. 3. 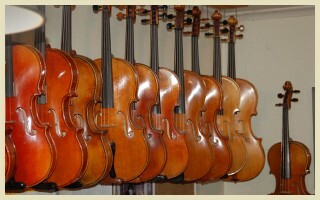 Age- Viollins, Violas, and Cellos can last hundreds of years if well cared for. 4. Condition- wear, damage, and repairs will effect the value. 5. Overall appearance and tone. Aesthetics and tone are subjective qualities. I gladly accept cash, personal checks, Visa, MasterCard and Discover cards. Because mine is a small company, I do not offer financing of any kind. If you need financing help, check with your bank before you come in. Many banks are sensitive to the needs and circumstances of musicians. If you are purchasing an instrument or bow from me, I will consider trade-ins not bought from me. Sometimes I may ask you to leave the item with me for a day or two so that I may arrive at a fair offer. Any instrument or bow that you buy from me can be traded in at a later date for another of equal or greater value. You will be given full value on the trade in if the instrument or bow is in the same condition it was in when you bought it. You must have your original receipt for trade-ins. 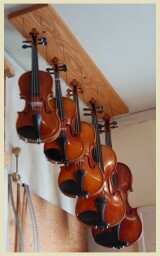 Any accessories you buy at the time you purchase a violin, viola, or cello are 20% off the retail price. The does not apply to bows. Strings are always 20% off. I do not feel that it is ethical to give secret commissions, or gift certificates to teachers. Download this PDF from The Strad, September 2006 for an interesting article about the topic of teacher commissions. Many times the teacher is the trusted source when considering a purchase from my shop. I believe that the teacher deserved to be treated with respect, and that their time and experience is valuable. It is up to the person or persons looking to buy an instrument or bow to compensate the teacher, not the shop selling the items. That would not be fair. The purchase of a stringed instrument or bow can be a substantial investment. It is common to seek the advice of an experienced player. This person is usually your teacher. If you buy an instrument or bow at my shop, your teacher will not secretly get any sort of commission from me. Many of the shops I compete against do this, however, and if you are relying on the objective advice of your teacher, it may help to be aware of this. Certainly you should compensate your teacher for his or her time if they help you to choose an instrument. Learning to discern quality from one instrument or bow is part of learning to play the instrument. Your teacher can serve you better by teaching you how to pick out the instrument or bow yourself rather than picking out the instrument or bow for you.